Pasha Evtukh - musician-guitarist- experimenter from the south of Belarus. Wants to warm and heat everyone with his music. He is playing guitar in a band "Mommy Beads". 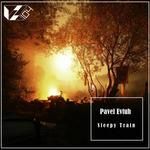 Paul's Evtukhov album "Sleepy Train" - is a cool stuff summer preserved in the sounds. Will be useful in the autumn-winter. Relax and you'll see a movie. The album also participated by Eugene Potapov. All tracks written and produced by Pavel Evtuh. Cover art by Pavel Evtuh.